By adding a test protocol for the selfie camera, DxOMark is covering all the imaging sensors that smartphones owners use - and preventing readers from any nasty surprises when they shoot with their phone's front camera. However, there are important modifications "to reflect the way front cameras are used". In its tests, DxOMark tries to "replicate most real-life front camera use cases", which include taking selfies of yourself, of yourself with a group of friends, indoor selfies, outdoor selfies, natural scenes, lab scenes, taking selfies with a selfie stick (multiple distances), and so on. And if we're being honest, Apple these days faces some stiff competition on the mobile camera front from any number of Android rivals. DxOMark has been testing, scoring and ranking the rear cameras on our smartphones since 2012, but this is the first time it has turned its attention to the front cameras. The list begins with a choice of 12 smartphones spanning across various price categories. 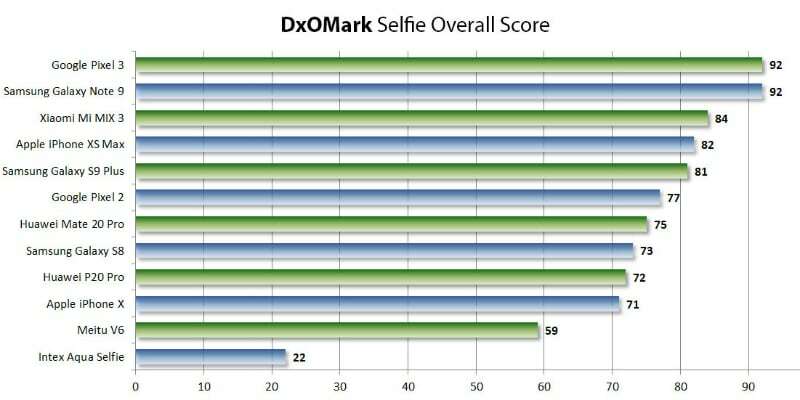 DxOMark also has a dedicated portrait test equipment to better understand the performance of selfie cameras. These are early days yet however, with only 10 phones as yet tested. It is now changing with the introduction of DxOMark Selfie test protocol. As someone who is often alone with my kids I love a decent selfie camera as I take a lot of photos of them with me myself - bit hard to do that with a rear-facing camera. The Pixel 3 has the upper hand when it comes to the focus system. Mi Mix 3 is at second with a score of 84 and iPhone XS Max got 82 scores for being at the third place. Samsung's Galaxy Note 9 released back in August and was certainly more of an iterative upgrade over its predecessor than a radical overhaul. However, the top spot is shared by the Pixel 3 and Galaxy Note 9 that both scored 92. As of January 2019, the Pixel 3 and the Galaxy Note 9 turned out to be the best phones for capturing self-portrait images and videos. Selfies on the Pixel 3 are claimed to have slightly stronger contrast and a cooler white balance.